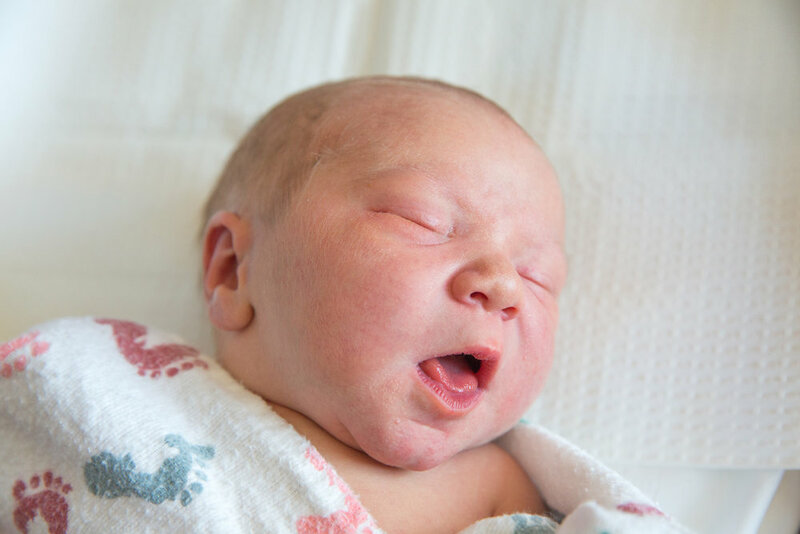 Fresh 48 Sessions are newborn portrait sessions at your baby's place of birth (hospital, birthing center, or home) within 48 hours of his or her birth. No matter the hours you spend gazing at your newborn baby the memory will fade and those tiny, adorable features change. As your baby grows, the portraits you own will only become more valuable to your heart. The tiny lips, fingers, toes, belly button. You want to remember these! Everything changes when a new baby arrives, time stops, our hearts grow, and priorities get shuffled. Being sure to get beautiful portraits of your growing family is essential. The Fresh 48 Session is a 60-90 minute photo shoot at your baby's place of birth: in your hospital room, birthing center, or home. Within minutes of a baby emerging from a mother's womb, the changes begin and I like to document these precious first hours before they're gone forever. 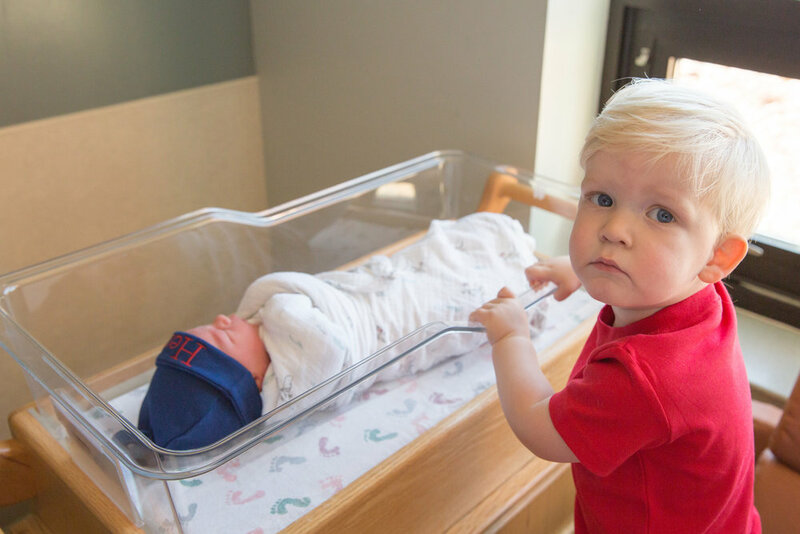 In order to remember that first day, I will be there to capture your little one's first yawns, stretches, diaper change, meeting the family, and the quiet moments between you and your little one. Siblings, parents, and grandparents are also welcome to join us. This is not a styled or posed newborn session. This will be a relaxed session and I will not be heavily posing, bringing lighting equipment, props. You are perfect now, hair and makeup are not encouraged. It is so important to exist in photographs for you, your family, and your child to enjoy later. Mom, please do not fret over how you feel you may appear after giving birth, your gorgeous glow will show through! You should dress very comfortably, you may want to wear a nursing tank and a bathrobe or yoga pants if you're feeling up to it. For Dad I ask that he wear casual, comfortable clothes with no words or logos. For your newborn I prefer only simple, classic onesies, snuggle toys, and wraps. I will be capturing your baby's sweet new moments in a fresh, natural way for a wonderfully timeless look. I am fully vaccinated and always wash hands/sanitize abundantly. I am also a mother of two and have lots of experience with newborn safety and handling babies properly. Contact me to receive my pricing and product PDF. 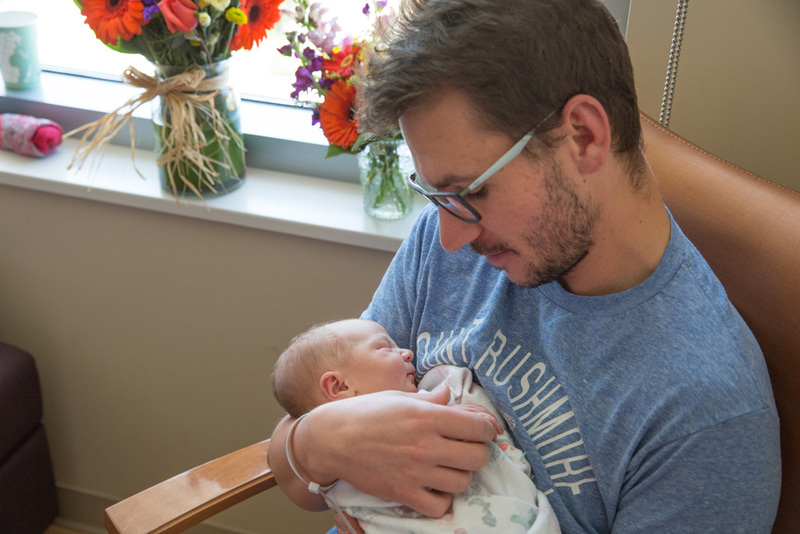 To help you prepare for your hospital or birth center stay, please download my complimentary Hospital Bag Checklist: A Guide To Your Comfy Hospital Stay, complete with everything you’ll want to pack for yourself and your beautiful new baby. I will travel to your location (hospital, birthing center, or home) to photograph your baby within 48 hours of delivery. Trip charges may apply outside of the Denver Metro area. When you call to notify me the baby has been born, I will confirm my arrival time - during daylight hours and as soon as possible. I prefer mid-morning sessions unless you need an afternoon shoot to accommodate older school-aged siblings. I will be with you for 60-90 minutes to meet and photograph you and your baby. I will be taking documentary, lifestyle photographs with available window light, unposed and natural. I will deliver images within one week of photographing you. I make every attempt to send you one edited and watermarked image the same day which you can use for announcements or social media. Each purchased print will come with a high resolution digital file and full print release. Viewing of your photographs for Fresh 48 Sessions will be available through an online gallery. This is to allow your new family to rest and snuggle as much as possible and without needing to schedule a time to come to my location for a viewing. If you prefer an in-person viewing or would like assistance choosing images and products, I am delighted to come to you or invite you to my in-home studio. When You Begin Going Into Labor: Please send a text or call me to give me an update so I know the beautiful event is coming near and so I can be sure my schedule is clear (this is a great job for your partner!). Also please let me know when your baby has emerged so we can determine the best time for me to join you for photographs. Before My Arrival: I suggest feeding your baby shortly before I arrive so we can have a full block of time before the next feeding time arrives. Also, if you have thermostat controls in your room, it helps keep baby nice and drowsy if the heat is turned up a few degrees or the air conditioning is turned down. My Arrival: Upon my arrival to your baby's place of birth, I will open the curtains and blinds to allow as much natural light as possible and I will turn off the overhead lights. I may tidy up a little bit to avoid some of the clutter from appearing in your photographs, I know how quickly a small hospital room can become messy in just a few short hours. If you are nursing, I'm happy to patiently wait outside the room if you wish, I know how difficult breastfeeding can be on both mom and baby. Conversely, if you would like photos of your baby nursing I would love to carefully get a few shots without disrupting your nursing session. Workflow: I like to work in the same flow, which works well for newborns and your support team. If your baby is sleeping in the bassinet when I arrive, I will begin there capturing a few sleepy moments. This will also give you a few minutes to finish getting ready or simply observe and relax. If baby is awake, I like to lay a fresh swaddle blanket down in the bassinet - you're welcome to bring a special one from home, use the hospital issued blankets, or I have many fun matching sets for girls and boys if needed. I will begin with photographing your baby in the bassinet. If mom is feeling up to coming over to the basinet I like to get some images of mom's hands touching the baby and mom and dad standing beside the bassinet. Then I will have mom hold the baby for a few minutes of photos and encourage dad to snuggle in next to them too. After that, I like to take several images of dad alone with baby. Next, mom is invited to get back in bed to get comfortable and dad will hand baby back to her and we will get some photographs in that space. Dad can join mom on the side of the bed to get some shots of the three of you. Next, if space and comfort allow, I will make a bit of a nest at the foot of mom's bed to have a few full body portraits and some unique angles separate from the bassinet. Lastly, I encourage any grandparents and family to participate. If siblings are there, they are welcome and encouraged to join in throughout. 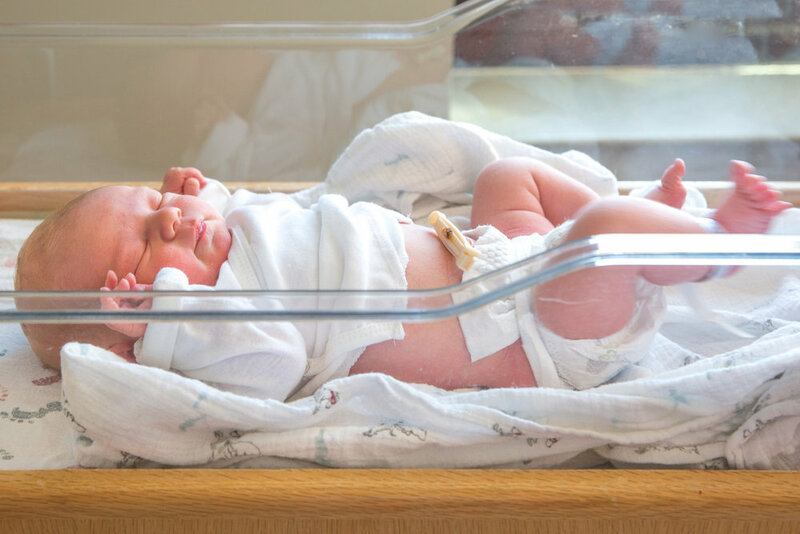 If things haven't gone according to your birth plan, and mother nature often throws us a curveball, I am happy to do your session in the NICU (with doctor/nurse approval), on your date of discharge to allow you more rest and recovery time, or we can reschedule to your home allowing you more time to adjust to any new circumstances. Delivery of Images: Fresh 48 Sessions are my highest priority and I strive to get them back to you for viewing within one week with a watermarked preview image emailed to you ASAP so you may share or post to social media. I will notify you as soon as they are complete and I will ask for your permission to post any images to my social media to be sure you have announced the birth of your precious new baby. We respect your privacy and won’t share your details, not even with your mother! Thank you very much! You will receive your discount code via email within 24 hours. I can’t wait to capture your next portrait session. Squee! !